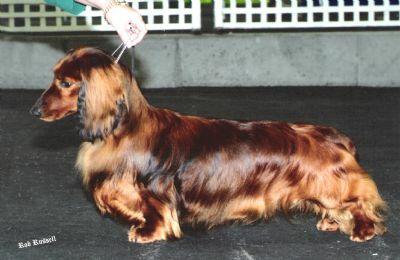 Leo is yet another successful Keaton Dachshund (Long Haired) from South Australia. He is the ideal show dog giving 110% at every outing. Sound from every angle with that "look at me" attitide. In 2007 Leo was Victoria's number 1 Scenthound & Australia's number 1 Dachshund (Long Haired)(* Dogzonlie pointscore). We are proud to own & show this grandson of the incomparable Ch Keaton Jaks. Leo is proving to be a very successful sire.